Buying a new hockey jersey can be a very difficult choice for a lot of fans. Maybe you’re stuck between a few of your favorite players, or you don’t know which style of jersey you want. You’re going to be spending a lot of money, and you want to make sure that your jersey will be relevant for a while. No matter who the player is, make sure it’s one of your favorites. Photo courtesy of MSG Photos. The player you choose is one that you will represent for a few years, hopefully. You want to make sure that the player you choose is one that you look up to or enjoy watching play. This could be anybody from a key contributor to a role player. My biggest advice is to choose someone that you like, not necessarily the most popular player. If your favorite player is Henrik Lundqvist, then by all means, buy a Lundqvist jersey. But if you love what Jesper Fast brings to the team, then don’t be afraid to by a Fast jersey. Personally, I usually like to buy jerseys of players that most people do not have. My first ever Rangers jersey was a Lundqvist home sweater, and then I bought a McDonagh jersey after his rookie season. For this past season, I decided to go with a Derick Brassard jersey. I always enjoyed watching him play with Zuccarello and Pouliot, and decided to choose him. Make sure that you really like the player whose jersey you get, and don’t worry if they’re not the most popular player on the team. Another factor to take into consideration is how long that player is tenured with the team. Since you will probably be spending a good chunk of change on a jersey, you don’t want to have that player traded later this year. 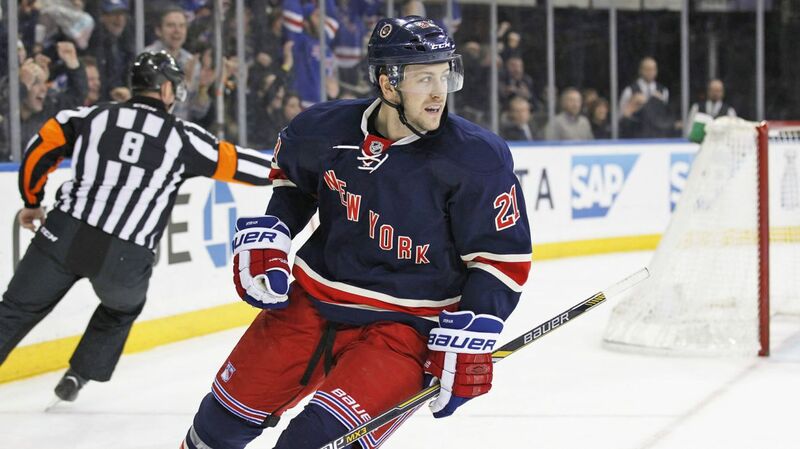 A good example would be Derek Stepan, who just signed a six year contract during the offseason. He’s young, a good player, and he’ll be here to stay. Henrik Lundqvist has been the backbone of the Rangers for a while, and he’ll be in blue for the next seven years. I was thinking about getting a Keith Yandle or Kevin Hayes jersey, but both players have expiring contracts at the end of this year, which makes me hesitant. If security is what you are looking for, then you should look at players that are under contract for a while and may even have a No Trade Clause. Players like Derick Brassard, Mats Zuccarello, Stepan, Dan Girardi, Marc Staal and Henrik Lundqvist are all very safe bets. Of course there is the awesome, home blue jersey, but you could also choose something like the alternate, dark blue jersey. Photo courtesy of MSG Photos. Choosing the type of jersey that you want is also important too. Many people go with the standard home blue, but there are other nice options as well. When I bought my Derick Brassard Jersey, I decided to stray from the home blue, and go with the alternate home jersey instead. I like to have variation in my jerseys, and the dark blue on the alternate is really nice. You can also choose the Winter Classic Jersey or the Stadium Series jersey too if you’re selecting a player that is still playing from that time. 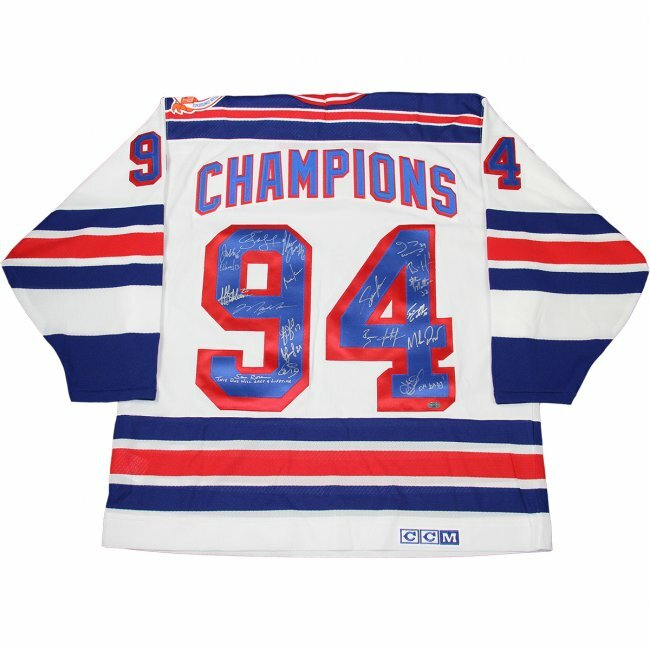 If you have fond memories of the Rangers from the 1990s, then there is always the option of buying a classic replica jersey. Marc Messier, Adam Graves and Mike Richter are all hallowed names amongst the Blueshirt faithful, and many people still wear their jerseys. This is never a bad option. If you’re really struggling to select a player, then maybe customizing a jersey is the right option for you. Easily to do and available on the team website. You can choose home or away, and add your name and favorite number on the back. There is no end to what you can do, and I’ve seen everything from a “Dubi-Staal) Jersey with the number 18, to a jersey that says Lord Stanley with the number 94 on the back. Customizing can be a great way to compromise or put your own personal twist on a sweater. One of the best options for a jersey is Henrik Lundqvist. Not only is he a really great player, but you know that he’s almost guaranteed to retire a Ranger, so you won’t be purchasing a new one for a while. If you’re looking to get a jersey from a forward, then Derek Stepan, Derick Brassard or Mats Zuccarello are all great choices, and long term choices. Other players like Rick Nash and Chris Kreider are good too. Ryan McDonagh is a great choice too, with lots of people choosing to don the captain’s sweater. The Iron Man Dan Girardi and Marc Staal are also important players in the lineup that should be here for a while. But if you really like one of the other players on the team, whether they be younger or role players like Dominic Moore or Jesper Fast, or want to make a unique, customized jersey, then go for it. It’s always cool to see different jerseys around the Garden and the city. Which jersey do you plan on getting? Let me know in the comments section below. Posted on August 27, 2015, in In the Crease and tagged Derick Brassard, Henrik Lundqvist, Lundqvist jersey, Madison Square Garden, MSG, Nash jersey, New York Rangers, New York Rangers Jersey, NYR, Rangers, Rangers Jersey, Rick Nash, Stepan Jersey, Which Rangers jersey should I get. Bookmark the permalink. Leave a comment.